From pantsuits to spacesuits, Hillary Clinton is making a statement. 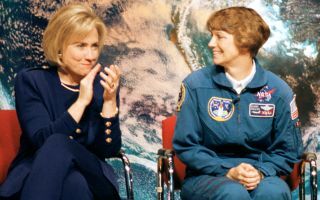 Hillary Clinton applauds now-retired NASA astronaut Eileen Collins, the first woman to command and pilot the space shuttle, during an outreach event at Dunbar High School in Washington, D.C., on March 5, 1998. Hillary Clinton, the former secretary of state and presidential candidate, whose pantsuits became a political fashion statement, is now making a statement about NASA's spacesuits. After NASA canceled the first all-female spacewalk in history due to a lack of spacesuits small enough to fit the average woman, Clinton chimed in with her advice. "Make another suit," she tweeted on Tuesday (March 26). Clinton has long advocated for gender equality and the empowerment of women, and she almost became the first female president of the United States, when she narrowly lost the 2016 election. So, it should come as no surprise that she's still advocating for equal treatment of women in her post-election life. But NASA won't be taking Clinton's advice to "make another suit" in order to hit this big milestone for women in space, because the situation is unfortunately not that simple. For one, building another spacesuit in orbit would take about 12 hours of crew labor, NASA spokesperson Stephanie Schierholz told Space.com. "Given the very busy operational schedule onboard the station this spring — the spacewalks as well as several resupply missions that will begin arriving in April — the teams made the decision to keep the schedule by swapping spacewalkers rather than reconfiguring a spacesuit," she said. But why didn't NASA have two of the right-size suits available to begin with, knowing that two women would be taking a spacewalk together? If the agency had all the parts in space already, why didn't it plan to use them? While many have speculated that NASA failed to sufficiently plan for its own spacewalk, a point that remains debatable, it's important to note that NASA made the decision to substitute one of the female spacewalkers with one of her male counterparts after she herself made that request. When NASA astronaut Anne McClain was training for her spacewalks on Earth, she was able to perform all of her tasks in both the medium and large spacesuits. Meanwhile, NASA astronaut Christina Koch, who was originally supposed to be McClain's spacewalking partner this Friday, has always worn a medium, Schierholz said. Medium is the smallest suit that NASA offers, and it's usually the size that women wear during spacewalks. McClain just so happened to be in between sizes, and she felt she could wear either one. To prepare three spacewalks (scheduled for March 22, March 29 and April 29), the Expedition 59 crew put together two suits, officially known as extravehicular mobility units (EMUs), to be worn by the pairs of spacewalkers. One is a size medium, and the other is a large. McClain wore both sizes of suits not only during her training on Earth, but also on the space station for fit checks, tailoring them to account for the way her body had changed in microgravity. For example, earlier this month she reported that she had grown 2 inches (5 centimeters) in space. Astronauts often grow taller in space because their spines relax and elongate elongate when not exposed to Earth's gravitational pull. After McClain finished her first spacewalk last week, she decided that she did not want to try wearing the large suit for her second spacewalk. Even though she fit the large while training on Earth and then grew even taller while in space, she felt that the larger suit would be less comfortable and more difficult to work in, thereby adding even more risk to an already-risky job, Schierholz said. Instead, McClain will be replaced by NASA astronaut Nick Hague, who wore the large suit during last week's spacewalk. It's true that NASA's 40-year-old spacesuits were built to fit the "average" astronaut at the time — in other words, the average male astronaut, considering the lack of women who had traveled to space back then. NASA has also long been plagued by gender inequality, much like most institutions in this country. But the fact that McClain will not be joining Koch for the first all-female spacewalk has less to do with gender bias and more to do with an astronaut's personal preferences — a decision that NASA argues it could not have foreseen.